The Year of the Five Emperors refers to the year 193 CE, in which there were five claimants for the title of Roman Emperor. The five were Pertinax, Didius Julianus, Pescennius Niger, Clodius Albinus and Septimus Severus. The year 193 opened with the murder of Commodus on New Year's Eve, 31 December 192 and the proclamation of the City Prefect Pertinax as Emperor on New Year's Day, 1 January 193. Pertinax was assassinated by the Praetorian Guard on 28 March 193. Later that day, Didius Julianus outmaneuvered Titus Flavius Sulpicianus (Pertinax's father-in-law and also the new City Prefect) for the title of Emperor. Flavius Sulpicianus offered to pay each soldier 20,000 sestertii to buy their loyalty (eight times their annual salary; also the same amount offered by Marcus Aurelius to secure their favours in 161). Didius Julianus however offered 25,000 to each soldier to win the auction and was proclaimed Emperor by the Roman Senate on 28 March. However, three other prominent Romans challenged for the throne: Pescennius Niger in Syria, Clodius Albinus in Britain, and Septimius Severus in Pannonia. Septimius Severus marched on Rome to oust Didius Julianus and had him decapitated on 1 June 193, then dismissed the Praetorian Guard and executed the soldiers who had killed Pertinax. 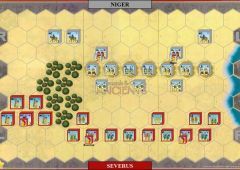 Consolidating his power, Septimius Severus battled Pescennius Niger at Cyzicus and Nicea in 193 and then decisively defeated him at Issus in 194. Clodius Albinus initially supported Septimius Severus believing that he would succeed him. 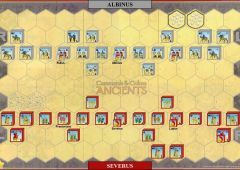 When he realised that Severus had other intentions, Albinus had himself declared Emperor in 195 but was defeated by Septimius Severus at the Battle of Lugdunum on 19 February 197.